During a panel discussion titled “A Regional Conversation on International Trade and Economic Development,” EDA’s Deputy Assistant Secretary (DAS) Matt Erskine and ITA’s U.S. 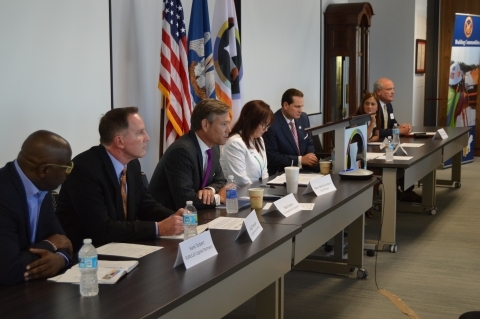 Export Assistance (USEAC) Director Greg Thompson joined DRA Chairman Chris Masingill, Mayor of Gretna, Louisiana Belinda Constant, as well as representatives from International Commerce and the Port of New Orleans to discuss how economic development efforts can spur international trade. Ten years ago, Hurricane Katrina devastated the Gulf Coast. More than 1,200 people died tragically, and property damage is estimated to have been more than $108 billion. In the ten years since the flood waters subsided, the people of the Gulf Region have demonstrated incredible resiliency and a strong will to restore the area to the vibrant, bustling community it was before the storms hit. That meant not only repairing the physical damage left by the storm, but working to repair the economic havoc the storm wreaked. The U.S. Department of Commerce’s International Trade Administration (ITA) and Economic Development Administration (EDA) are proud to be partners in those efforts. Over the last decade, EDA has invested more than $32 million, and in the immediate aftermath of the storm, invested nearly $10 million in seven separate projects throughout the region, including supporting strategic capacity rebuilding and counseling for affected small business owners. More than 40 ITA Commercial Service employees volunteered to help in the Gulf immediately following the storm, turning a Trade Information Center into a call center for affected businesses. The volunteers worked proactively with state and local officials to develop export seminars, trade missions, and other business promotion programs. Both ITA and EDA have continued to support efforts in the Gulf during the past decade. EDA’s Deputy Assistant Secretary (DAS) Matt Erskine and ITA’s U.S. Export Assistance (USEAC) Director Greg Thompson participated in a series of events coordinated by the Delta Regional Authority (DRA) to discuss ways to promote trade and bolster economic resiliency. During a panel discussion titled“A Regional Conversation on International Trade and Economic Development,” Erskine and Thompson joined DRA Chairman Chris Masingill, Mayor of Gretna, Louisiana Belinda Constant, as well as representatives from International Commerce and the Port of New Orleans to discuss how economic development efforts can spur international trade. DAS Erskine also took the opportunity to announce several grants and a new partnership with DRA to promote resiliency in the region. EDA made four awards, totaling $2.1 million dollars for a variety of projects that support entrepreneurship, promote trade and investment, and enhance emergency and disaster preparedness. EDA’s new partnership with DRA will result in a series of disaster planning and resiliency training programs for public officials and practitioners in the Delta region. New Orleans and the entire Gulf Region are committed to not just rebuilding their great cities, but making it better and stronger. ITA, EDA, and the entire Department of Commerce have been there as a partner and resource for the last decade and will continue to support the region for decades to come.